Why do you go to church? Do you go for the sermon? Do you go for the prayers? Do you go for the singing? Do you go for the fellowship? Do you go out of guilt? Do you go out of habit? Or don’t you go at all? I’m sure you’ll agree with me when I say my greatest need is to be with God and one of the most powerful ways I can be with God is in church. Sure I know I can be with God outside of church but sitting inside a sanctuary dedicated to God I can be with him in an entirely different way than anywhere else. 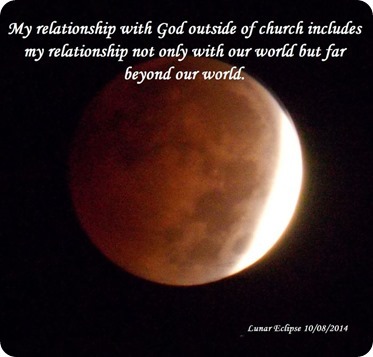 My relationship with God outside of church includes my relationship not only with our world but far beyond our world. But inside the church it’s the two of us, sure there are others present but in church we are all on the same page – we are there to be with God and God is there to be with us! It was God’s love for him and David’s need for God that drew David into the “holy temple” (church) where David was able worship and give God the respect (fear) due him for all the love blessings God gave him. David also knew that since he would be in God’s presence God would spiritually equip him for what he’d confront once he exited the church and rejoined the world. When it comes to you God focuses only on you. And all God wants in return is on a regular basis for you to take the time to focus only on him and church attendance affords us the time and place where we can do just that. God gives you eternity don’t you think the least you can do is give him a few hours every week. I can assure you, you are worth every minute you spend with God!